16 Instruments...Fits in your Pocket!!!!!! Learn to play the piano, all without purchasing a pricey and bulky keyboard. 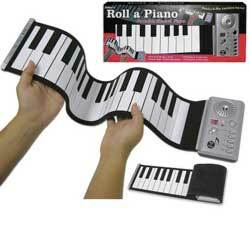 Small enough to fit into a pouch, the Roll Up Electric Piano lets you practice and play anywhere you desire. Despite its size, you get amazing music quality!! !